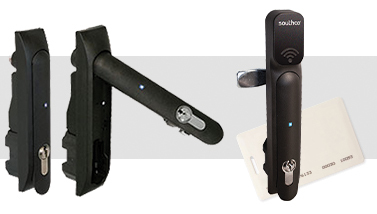 Southco’s H3-EM Electronic Locking Swinghandle features an efficient microprocessor-controlled gear motor design that ensures minimal power consumption and provides intelligent locking and monitoring capabilities. The H3-EM can be used as a standalone system, integrated with an existing building access control system or supplied as a fully networked system enabling remote monitoring and audit trail reporting to meet compliance requirements, such as HIPAA and Sarbanes Oxley. The H3-EM Electronic Locking Swinghandle can easily accommodate a variety of rack sizes and configurations with its simple, single-hole panel preparation. Available with integrated biometric reader.